Which city stands out as North Carolina’s most best living destination? I had to ask myself this question as I was coming out of school and choosing a place to live. Now, friends and relatives that are moving into the area are asking me the same. 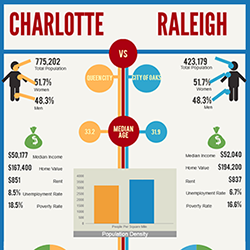 So, I’ve decided to craft an infographic of aggregated data, showing the Charlotte vs Raleigh side by side. Why not make this the first demographic data release by my web agency? This is by no means a statement that Charlotte or Raleigh is the coolest, or best city to live in NC; see: Asheville, Wilmington, Boone. I personally currently live in Cary, and plan to buy property in the Holly Springs area. They are, however, the largest cities in the state. As well as centers for jobs, business growth, economic development, and the primary destination for folks relocating to our area. Therefore, in my opinion, charlotte vs raleigh warrants discussion and data based comparison. Where would you prefer to live? Please include attribution to CarolinaAdGroup.com with this graphic.